Photonic cavities are gathering a large amount of interest to enhance the energy transfer between two dipoles, with far-reaching consequences for applications in photovoltaics, lighting sources, and molecular biosensing. However, experimental difficulties in controlling the dipoles’ positions, orientations, and spectra have limited the earlier work in the visible part of the spectrum, and have led to inconsistent results. Here, we directly map the energy transfer of microwaves between two dipoles inside a resonant half-wavelength cavity with ultrahigh control in space and frequency. Our approach extends Förster resonance energy-transfer (FRET) theory to microwave frequencies and bridges the gap between the descriptions of FRET using quantum electrodynamics and microwave engineering. 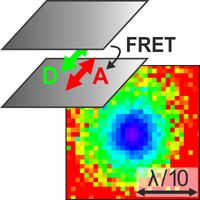 Beyond the conceptual interest, we show how this approach can be used to optimize the design of photonic cavities to enhance dipole-dipole interactions and FRET.